Enforce the Galactic Empire’s will with this Imperial Patrol Battle Pack. Help the Recruitment Officer sign up new soldiers to strengthen the Imperial Army. Work with the Emigration Officer to banish unwanted citizens with the help of the Patrol Troopers and their speeder. With this imposing battle pack, order WILL be restored to the galaxy! Price is 20% below the initial Lego retail price, a € 2.91 discount! This comes down to 12.11 cent per brick. 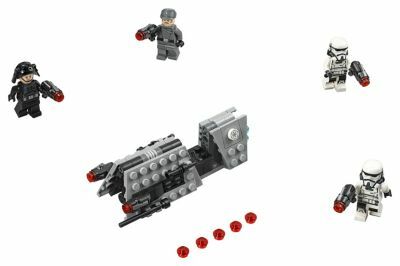 The Imperial Patrol Battle Pack (75207) Lego set is available from the sites below. However, they do not offer delivery to your selected region. The Imperial Patrol Battle Pack (75207) Lego set is no longer directly available from the sites below. However, 3rd party partners of these sites might still have the set available. Alternate description Patrol the Empire and enforce the rule of law! Speeder measures over 1” (3cm) high, 5” (13cm) long and 1” (5cm) wide.